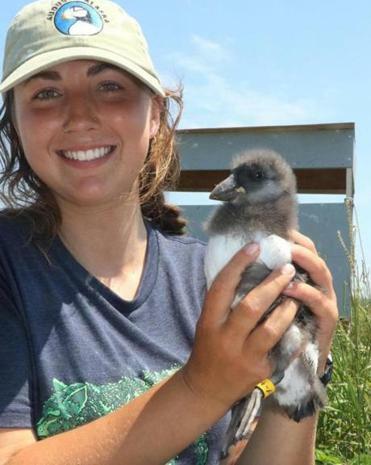 Research assistant Alyssa Eby held a puffin chick at Eastern Egg Rock off of Maine. PORTLAND, Maine (AP) — Puffins face existential challenges, but the little birds found a new role in Maine this summer: baby boomers. The 2017 nesting season was the most productive on record for a group of vulnerable Maine puffins, scientists with the Audubon Society said. The Atlantic puffins are small seabirds with an awkward walk and colorful beaks that are popular with eco-tourists. The birds are at the southern edge of their breeding range in Maine, and the Eastern Egg Rock colony in Muscongus Bay is the subject of much study. Audubon reported that the colony increased from 150 to 172 pairs during this year’s nesting season. That is the highest single-year increase since puffins recolonized the little island in 1981, said Steve Kress, a biologist and vice president for bird conservation with Audubon. Atlantic puffins are listed as vulnerable by the International Union for Conservation of Nature. Scientists say they are threatened by factors such as warming oceans and changing availability of the small fish they need to survive. But Audubon reports multiple positive signs about the birds this year. The society said puffins nesting on nearby Seal Island and Matinicus Rock also had strong years for reproduction. Seal Island saw 86 percent of puffin pairs successfully fledge a chick, which was one of the best seasons ever recorded for the colony, Audubon said. Audubon reported that slightly cooler sea surface temperatures appeared to help create conditions for abundant forage fish for the puffins to eat. Many of the puffin chicks on Eastern Egg Rock were chubby, which bodes well because plumper chicks have a better chance of surviving when they head off to sea without their parents, Kress said. The birds still exhibit poor reproduction in other parts of their range, such as Iceland, Kress said. And he said the warming waters of the Gulf of Maine, which is warming faster than most of the world’s oceans, remain a long-term concern. But the birds’ good year in Maine is cause to celebrate, said Priscilla Brooks, vice president and director of ocean conservation for the Conservation Law Foundation in Boston.